I was introduced to Tikatok by my friend, Jackie Gerstein, when I visited her class in Sahuarita, AZ and was so impressed with the books her students were creating. Inspired after my visit, I have been waiting to try it out with a real story and my opportunity has come. 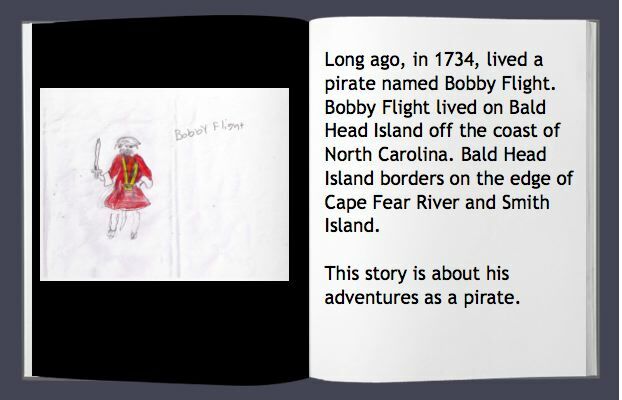 My 4th grade grandson has written a pirate story for a class project and with his creativity and my Tikatok account we have created our first book. His assignment was to write a story about his adventures as a pirate that included the following details: pirate name, name of his ship, where his hideout was located (on the NC coast), use as many pirate vocabulary words as possible, include a drawing of himself as a pirate and a drawing of his Jolly Roger, plus any additional information he wanted us to know about his life as a pirate. While the assignment was to create a written project to turn in (pencil, ink, or typed) we thought it would be fun to also create a Tikatok book that could be shared online. We used his original writing and drawings, and added several images from Compfight which provides images that can be freely used with Creative Commons licensing with attribution. While we still have lots to learn and explore we are excited about our first creation. I especially like the feature that allows you to continue editing your book after it’s created and the URL remains the same so anyone you share the URL with will always see your latest version. If you have tried Tikatok with your students I would love to see examples and hear your tips/tricks for creating books. If you’re considering some live streaming, I strongly encourage you to give Mogulus (now LiveStream) a try!! I have been exploring and using the Mogulus Channel for live streaming and have been extremely impressed with how easy it is to navigate and produce online videos (both live and recorded sessions). The service has changed it’s name to LiveStream but appears to offer the same fantastic, free services I have been enjoying. This announcement was posted in the LiveStream Blog on May 19, 2009 and included the following information. I was so pleased with my experience in the creation of a special AzTEA Channel (AZ Technology in Education Alliance) that today I decided to create a personal channel to be able to stream and upload videos for our very own family around the world to stay connected in one location. The AzTEA Channel is being used to record and stream live events such as meetings, conferences, and professional development sessions. I have also included several YouTube videos just so I could explore this feature and to be able to vary the content to inspire others to try this incredible tool. I decided to name my family channel “Family and Me“–a spin-off from the delightful movie “Marley and Me” because there are so many fun, family adventures in that movie. Feel free to drop in and view either channel to see what’s possible, recognizing you’re viewing the efforts of a real beginner! I love the fact that you can embed the player for your channel on your website or wiki. You can also embed just a single video (embed code is provided for you!) It doesn’t get any easier than that!! This photo video/slideshow was created with a free, online tool called PhotoPeach. It is a very flexible, creative, intuitive tool that makes it very easy to add photos and captions, select music, and they provide a way for viewers to add comments to the show. It is a Beta service right now, and they have been very responsive to requests from users for features. I’m excited to report that they responded to my request and have now included a way to delete comments (important for school use). If you make a typo or change your mind about a comment/caption you have added you can easily go back and delete it and re-enter it. You can add your comment about a specific photo. Even friends and family without a PhotoPeach account can add comments to your video. This suggests some very creative possibilities for student collaboration in creating a video and collaborating on photos, music and captions! Express Import lets you import all new albums from your existing albums on other services and automatically convert them to PhotoPeach slideshows. I imported my photos from Picasa on Google and was amazed at how quickly they uploaded! Once they are imported you can remove individual photos from the album before you publish it. You are allowed up to 100 photos per video in the free account. For now with Express Import, your background music is chosen by the system, but you can change it afterwards from their extensive collection of music. If you use Express Import in the future, the system will auto-detect new albums, and import only albums that you did not import to avoid duplicates. They have lots of variety in the choices you can make for music but you can’t yet upload your own music. You can embed your video in a blog, wiki or website as well as export it to Facebook or via email. You can choose to make it public, unlisted or by invitation only. I especially like that the default is “unlisted” so YOU can make the choice whether you want it public or not. I was really happy to see that if you select to view the video in full screen view that it doesn’t lose photo quality and it is a wonderful viewing experience! I encourage you to take it for a spin! I think you’re going to love it! I’m very excited about this tool and plan to explore the possibilities for different uses for the classroom. This is my first attempt to create a PhotoPeach slideshow. Feel free to add your comment to my slideshow if there’s a photo you especially enjoy. This post started out as a test to see if I could upload a movie from my Flip Video camera to my blog. I was delighted to find that it not only was a successful upload, but that it retained very good quality. I am using an older model of Flip Video from Pure Digital (60 min. capacity) which I purchased on sale at Office Max for $129.00. There are newer models available now with improved features and the prices have actually come down. If I were to buy one now I would choose one that has the ability to be re-charged because you can go through the AA batteries pretty quickly. I would also like to have one that has more zoom capability. I took photos of a high school performance in a dark auditorium and while the photos were quite clear in spite of the conditions, I couldn’t zoom in as much as I would have liked. I chose to post the short video clip of wakeboarding on the lake because it wasn’t a “close-up” but still captured the moment. You can also take still photos with the camera. I love how easy it is to carry (light-weight, fits easily in pocket or purse). I also really like the flip-out USB arm that allows you to plug into your computer without an additional cable and download your videos. I was able to take lots of short segments with room to spare on my 60-minute capacity and then drop all of them into iMovie on my MacBookPro to add still photos, music, captions, transitions and create a very nice finished product. Of course it doesn’t have the features and quality of my Canon DVR but it is a great, inexpensive, portable alternative that allows you to always be prepared to capture those spontaneous moments that can pass so quickly! No setup is required, just turn it on and click on record. I’m really enjoying exploring the potential of my FlipVideo camera! This was an incredible moment captured with my FlipVideo camera. I was so “tickled” to realize that we could use a cell phone to call Costco’s while connected wirelessly to the internet to order a new DVR camera while out in the mountains camping! A moment worth capturing! One of the regular EdTechTalk webcasters, Matt Montagne, has been doing some amazing things with students, and I have recently had the privilege of tuning in to some of his latest endeavors. If you are interested in hearing the “student voice” about the importance of technology in their learning, tune in to these podcasts and listen. The information is so valuable and the process of student focus groups is one that you might want to consider using with students in your schools. Kyle Barriger (HS math teacher) and I (Matt Montagne) will be conducting a few student focus group sessions over the balance of the school year. The idea of these meetings is to gather information from the students that could be useful in making decisions in the future relating to instructional technology. I met with 8 very sharp students today to begin these conversations. We had a list of 10 questions or so, and I think we only got through the first 2-3 in our 25 minutes together! I think you’ll appreciate the candor on the part of the students. 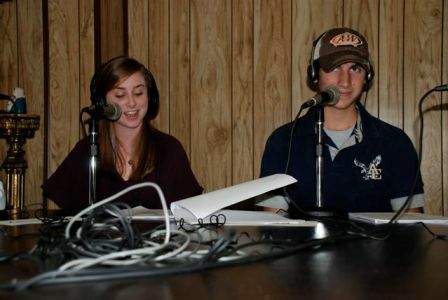 Another really interesting place to tune in to the “student voice” is on a bi-weekly radio show Matt Montagne is broadcasting with his students called GatorRadio. The students run the entire show and hold some very interesting, thought-provoking discussions. They don’t just talk about school activities and teen life, but tackle some very challenging world issues. One recent discussion had them debating which social network they preferred: MySpace or Facebook. Can you guess which one they chose? Listen to the show to find out. 🙂 The broadcasts are usually held on Wednesday evenings (8:00pm PST) and I encourage you to join the streamed conversation and participate in the chat with these creative, bright, talented, enthusiastic students! You won’t be disappointed! As educators, we need to be listening to our students as we plan our instruction to prepare them for living, learning and digital citizenship in the 21st century! You also might want to consider signing up for your own show. BlogTalk Radio is a free online service for broadcasting. Information from their site: BlogTalkRadio is the social radio network that allows users to connect quickly and directly with their audience. Using an ordinary telephone and computer hosts can create free, live, call-in talk shows with unlimited participants that are automatically archived and made available as podcasts. No software download is required. Listeners can subscribe to shows via RSS into iTunes and other feed readers. The shows are archived and people can join to receive email alerts for upcoming shows (notification in your own time zone), subscribe via RSS readers or just go to the site to listen to the shows. Your shows don’t have to be weekly–you can schedule them any way you like and for any length of time you choose. If you have something you love sharing with people (ideas, tips, tutorials, entertainment, etc.) this would be something great to try out. Thanksgiving-A Time To Be Thankful! One more tool I have really enjoyed using to send personalized, online greetings for various holidays is ScrapBlog. I have shared this tool before (July, 2008) but I REALLY love it! The tool is so easy to use and you can upload photos, videos and be as creative as you like in compiling your greeting. Templates are offered to get you started but you can also start from scratch and create your own. This is an example of a Thanksgiving greeting I created last year with photos, YouTube video and background music. Maybe this will give you some ideas about how you can use this wonderful tool. Happy Thanksgiving to everyone!! I just discovered a new, free online tool from Suzie Vesper’s wikispace that I’m very excited about. It is called AuthorStream (http://www.authorstream.com). It allows you to upload a PowerPoint presentation that maintains the original settings (such as text that loads one line at a time). The hyperlinks are clickable and the slides easily advance. The bonus is that you can choose the option to “Present Live” and it provides you with a discussion window where you can invite people to join you to discussion the presentation via an invite URL. It provides a fantastic alternative for making a PowerPoint presentation interactive and collaborative. I have been using SlideShare (http://www.slideshare.net) and while it has some wonderful features including the ability to add audio to your slides and make it a self-running presentation in a Slidecast, it also has some limitations. I had been frustrated by trying to get the hyperlinks in Slideshare presentations to actually work and easily move back and forth between the presentation and the link and this problem seems to be solved with AuthorStream. While I am continuing to explore the features on AuthorStream, I am very excited by the potential of the application. There are a few places where the alignment of the text changed with the uploaded presentation so that is a minor issue for me to explore. Give it a try and let me know what you think of it.